The littlest things can sometimes cause the most trouble. That seems to be the case with mice, rats, and other rodents who can get in your vehicle and damage important components with their teeth. To keep them away, there are a few things that we at Hendrick MINI recommend to our customers. Rodents need to eat, and they like having small, cozy spaces to rest in. Nooks and crannies in garages and the landscaping around driveways is often perfect for them. 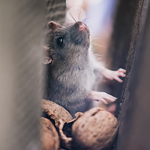 To reduce the likelihood of rodent issues, maintain a tidy area and set traps if you notice droppings or other evidence. Inside your vehicle, you can create barriers that prevent them from getting under the hood. Wire mesh can be used to block openings and still let air through. Rodent-deterrent tape can be wrapped around wires and tubing. Because it is treated with spicy capsaicin, it will hopefully send rodents running in the opposite direction.